Familiar Faces — Mobers.ORG — Your Daily Source For Mobile FUN! Is a Brain capabilities tester game. The aim of the game is to recognize a face you know, among many other faces you don't know as fast as you can. As the levels go higher you need to be able to recognize the familiar face just by the mouth or just by the eyes. It also becomes harder, as the number of faces, from which you need to find the familiar face, grows larger. Face recognition is a special ability that uses a specific part of the brain, it can be tested and trained. 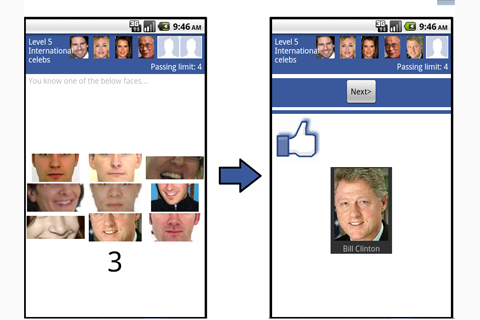 If you have a facebook account, Familiar Faces is able to bring your friend's faces for you to play with. It's really fun to see how hard or easy it is for you to find your friends among faces you don't know. The process of importing your facebook friends faces takes a few minutes depending on the network speed and device strength. Not all your friends have pictures we are able to use, so you need to have enough friends (~80) for us to be able to bring enough faces a fun game. The game is free. At first the game is limited – you can play up to level 8, using international celebrities and your facebook friends faces. To play above level 8 and with other groups of familiar faces, you need to pay. If you keep the game installed for one week, all features will be enabled for free!